In many ways, madrassas are a cornerpiece in Islamic community life. They are seminaries where children go for religious education, and in poor neighbourhoods, for non-formal schooling. In keeping with this tradition, the Darul Ujloom Madrassa, set up in 1992 by three maulvis of the Barelvi sect, is supposed to house 150 poor Muslim children and provide them with shelter, education and food. Far from doing this though, in a disturbing twist, Tehelka found that the Darul Ujloom Madrassa was illegally sending its minor children out to work harrowing twelve hour shifts at nearby factories and sweatshops. In keeping with this tradition, the Darul Ujloom Madrassa, set up in 1992 by three maulvis of the Barelvi sect, is supposed to house 150 poor Muslim children and provide them with shelter, education and food. Far from doing this though, in a disturbing twist, TEHELKA found that the Darul Ujloom Madrassa was illegally sending its minor children out to work harrowing twelve hour shifts at nearby factories and sweatshops. This is the symptomatic story of one such child. Ten-year-old Anees is the son of a daily wage labourer in the Purnea district of Bihar. Bihar has the highest number of Muslims in the country after Uttar Pradesh and West Bengal. According to the 2001 census, 87 percent of Muslims in the state live in rural areas, of which 49 percent fall below the poverty line. On an average, two out of every three Muslim households in rural Bihar send at least one child away for better prospects. Anees’ father was no different. His daily income of 50 was barely enough to provide three meals a day to a family of eight. So one day, when a man called “Chachu” came to him and suggested that his eldest son should be sent to a madrassa in Delhi where he could become a Hafiz Quran — someone who has memorised the entire Holy Book — the father readily agreed. Tipped off by activists, the TEHELKA reporter posed as a Lucknow-based NGO that funds vocational training, to gain entry into the madrassa. This is what Anees said on our spycam. TEHELKA: At what time do the classes take place? ANEES: Morning. Eight to 10. ANEES: Yes. After that I go to work. TEHELKA: Where do you work? TEHELKA: What work do you do there? ANEES: I am part of the packing team. TEHELKA: What are your work timings? ANEES: From 2 pm to 10 pm. TEHELKA: How much money do you get? TEHELKA: For how long have you been working? TEHELKA: Do you have an I-card? TEHELKA: Do your parents know about this? When we ask Anees what he does with the money he earns, the maulvis tell him to leave the room. We ask permission to walk around. The madrassa is a warren of tiny rooms strung together like train compartments. The children’s luggage is stacked up, leaving little spare space. While some rooms are open, most are locked. Like little Anees, most of the children are obviously away at work. Anees’ own 2 pm shift is approaching. THE STARK and appalling story of child labour is not a new one. In November 2009, TEHELKA had published a wideranging story on child trafficking and labour (Pimped, Abandoned, Sold). But like in a report we published a month ago, The Half Life of a Coal Child — where we described the medieval horror of children working in the rat mines of Meghalaya — this story unearths a new and dark narrative of child labour that should serve as a timely wake-up call for the community. It is a narrative that speaks of children repeatedly lured away from disenfranchised parents in the name of religion and pushed into hellish chutes of hard work, little food and — mostly — no pay. As yet, the TEHELKA investigation itself is a slim one. Though we spent several months on it, our story covers only five madrassas in Delhi and it is difficult to gauge how rampant the phenomenon is. Getting access to madrassas is not easy and, according to an estimate by the Human Resource and Education ministry, there are about 1.5 million children enrolled in the 35,000 madarassas in the country. Just Delhi has 5,000 madrassas and that does not include the ones that are unregistered. TEHELKA: We want to know if students of your madrassa work somewhere. NASEEM: See, poor parents cannot afford their children’s expenses.There’s no harm if the children work a bit and earn some money. TEHELKA: So what time do the classes take place? NASEEM: From 8 am to 11.30 am. But for children who go to work, we let them off at 10 am. TEHELKA: Where do they work? NASEEM: Zari factory, cold storage, garment factory, mobile shops and others. TEHELKA: Are the places they work at close by? NASEEM: Yes. They are across the road in Shakurpur village. 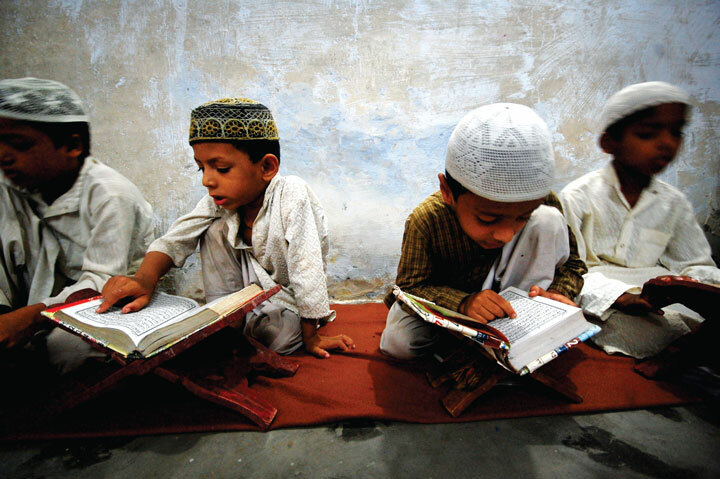 TEHELKA: Are all the expenses of the kids borne by the madrassa? NASEEM: Yes. All expenses for food, lodging and education are on us. TEHELKA: How many meals are the children provided? NASEEM: We can’t say about those who go to work. We provide meals to only those who stay back. TEHELKA: What is the strength of the madrassa? TEHELKA: Out of this, how many do not work? Unwittingly, Maulvi Naseem’s answers are a dead giveaway. While TEHELKA could find no evidence of either maulvi directly benefiting from the commercial outlets where their wards are employed, both Kadri and Naseem talk about the costs of running the establishment. Three meals a day per child is around Rs. 600 a month, they say. “But,” says Naseem, “we always tell their employers to provide them their meals.” Just a quick, back-of-the-envelope calculation reveals that if 120 out of 150 children go to work and are fed outside, there is a monthly saving of Rs.78,000 for the madrassa. There is no one to audit what the maulvis do with that saving. Food — or the absence of it — is perhaps the most heart-breaking aspect of the story. Like Anees, Mohammad Kallan is an 11-year-old boy living in the Darul Ujloom madrassa. He works a punishing 9 am to 9pm shift in a garment factory in Shakurpur village. Kallan says he stitches jeans ‘jismein Akshay Kumar ki photo aati hai’ ( jeans endorsed by actor Akshay Kumar). Though TEHELKA could not independently corroborate whether these were fakes or genuine, it seems from Kallan’s assertion that he works in a factory that supplies Spykar jeans. Kallan boasts disarmingly that, after two years of work, he can now stitch pockets on ten pairs of jeans in an hour. Contrary to Maulvi Naseem’s cold argument, however, that it’s okay if poor kids work to earn, Kallan has never been paid. “It’s okay,” he says, “I am just a trainee. From next year they have said they will pay me Rs.1,200 per month.” His innocence is searing. Employing young children as apprentices or trainees without registering them is a common practice in the unorganised sector — saving the cost of adult labour — but is illegal as per the Apprenticeship Act. Understandably, the factory owners where the boys work are far less forthcoming than the maulvis. Despite several guises, the TEHELKA reporter could not gain entry into the factory — turned away each time by hostile guards. GUNAAH CAN have many ugly rungs. The Faiz-e-Azam Madrassa in North Delhi’s Khajoori Khas area is a two-anda- half-room quarter. Here, 20 kids in the age group of 5-10 years are packing bindis. A plywood partition blocks most of the light in the room. On the other side of the partition there are more children — all under 10 years of age. Sitting around a low coffee table, each child is engrossed in the painstaking task of embellishing bindis with crystals. It’s a hot summer afternoon. The radio is blaring at full volume. There is no fan or elbow room. The previous day, the TEHELKA reporter had entered the premises as a prospective buyer. Now, suddenly, in front of our eyes, Maulvi Iftekaar Kadri — the custodian of the madrassa — enters the room in a tearing hurry and asks the children to take out their books. On cue, the bindis are put away. The kids sit cross-legged in four neat queues. A roller board is pulled out. The maulvi starts teaching. And for every month that neither community elders nor the Indian State puts a check on it, more children like Mohammad Akmal fall prey to men like Maulvi Iftekar Kadri. Akmal, 9, came to the madrassa two years back. His father, a rickshaw puller, sent him from Bihar’s Araria district with his cousin Saquib, who had been living in Delhi for seven years. Saquib handed him over to ‘Kadri Sa’ab’ and never reappeared. Akmal was left to cut his teeth in the bindi business. The children embellished dozens of packets every day — waking at 7 am and working till 10 pm. They were never allowed even to step out into the terrace. “Maulvi Sa’ab told me the classes will begin soon and till then I should learn this work,” says Akmal. “But classes haven’t begun till date.” Then haltingly, he goes on to tell a hair-raising story. “Initially,” Akmal recalls, “I was very slow. I could only make 20-30 packets per day. One day Kadri Sa’ab got angry and asked everyone to teach me a lesson.” All the children were asked to spit and pee on him. “I vomitted and cried. And then I picked up,” he says. Akmal can now prepare 100 packets a day. The shelves of the workstations around him are lined with books. The bindi embellishments are packed in cute Minnie Mouse pencil boxes — ironic reminders of the childhood he was owed. Akmal has not been home in two years. He says he wants to play gulli-danda with his younger brother Rafiq. He is paid 50 every Sunday for his work. His life’s reprieve is the food he buys from a ‘hotel’ with that money every week. As for Maulvi Iftekar Kadri and his accomplices — SDM AK Sharma alleges they generate a profit of at least 40,000 every month by selling the bindis in the market. Betraying both religion and humanity in the process. AS ASSERTED earlier, TEHELKA’s investigation can only be read as a kind of “smell test” for a lurking problem. No one is quite sure how deep the problem runs but there is a growing premonition. Bachpan Bachao Andolan — an NGO that has been working on issues of child trafficking for years — says they have rescued approximately 50 children from various madrassas in Delhi in the last one year. Last year, acting on the recommendation of the Sachar Committee Report, HRD Minister Kapil Sibal had proposed the formation of a Central Madrassa Board which would provide assistance in conducting exams, awarding qualifications, designing curriculum as well as developing infrastructure to help create uniform standards in the non-theological aspects of madrassa education. Perhaps this would have gone some way in creating accountability. However, under flak from some quarters of the Muslim community, the idea was shelved. AGAIN, A closer watch is certainly what little boys like seven-year-old Mohammad Nanhe desperately need. Nanhe was recently rescued from a small madrassa in LNJP colony whose name he can’t recall. (His rescuers say it was Alia Arabia Madrassa.) When asked what work he did there, he promptly tells us how to make a silver earring. “Take a long silver wire, cut it into two parts. Put the green and red beads alternately and entwine it in the wire. It’s done,” he says. According to Nanhe, he could prepare 20 pairs of earrings a day and a lot of foreigners used to come and buy the jewellery in stacks. The learning curve was gruesome. The fingers of Nanhe’s right hand were brutally snapped with a wire cutter for wasting “expensive” silver wire: two fingers were broken, the rest were badly wounded. It is in this madrassa that Nanhe also learned a bit of Urdu, math and Hindi. After two years of torture, Nanhe and three of his friends were rescued and housed in Mukti Ashram, a short stay home of the Bachpan Bachao Andolan (BBA) in Buradi village, New Delhi. Ask him if he’s told his parents back in Katihaar district of Bihar of his plight and he retorts, “What’s the point? They will unnecessarily wail and cry and be tense.” Hearing such resignation from a seven-year-old is deeply disquieting. The huge and recurrent presence of children being trafficked from Bihar is strikingly tragic. According to some estimates, Bihar has almost 4,000 madrassas but families continue to send their children thousands of kilometres away — seduced by the idea of Delhi as the theatre for a larger life. It is probably a dream like that lured nine-year old Junaid from Sitamarhi in Bihar. PM Nair’s book on trafficking says that almost 54.1 percent of children or women are brought in groups. True enough, in a depressingly familiar routine, Junaid was brought along with six other children by a “Chachu” to the Zeenatul Madrassa in Nangloi, a Jat-dominated neighbourhood in North Delhi. Like the Faiz-e-Azam Madrassa in Khajoori Khas, this madrassa in Nangloi is not officially affiliated to any sect or body. It is a madrassa only in name. On ground, it is a transit camp for children being trafficked as bonded labour. “Chachu said he will be back in the evening,” says Junaid. “It’s been a year now, he hasn’t come.” In the meantime, Maulvi Allama Hasnain Raza Khan — the man Junaid was entrusted to — handed him over to a man he calls ‘seth.’ Seth turned out to be a man called Prashant Prasad, who owns a footwear factory in Nangloi, imaginatively called Jootaland. Along with the other kids, Junaid’s work shift stretched from 8 am to 10 pm. He recalls, “Once, during a police raid, the seth tied me in a sack and kept me in the godown.” When the sack was opened in the evening, he was found unconscious. Junaid was promised a salary of Rs. 1,200 a month. He has never got it. “The seth says he will give it to me when I go back home.” When, he doesn’t know. Posing as a prospective buyer, TEHELKA visited Jootaland, which is just 500 meters from the Nangloi police station. Here’s what Prashant Prasad said on camera. TEHELKA: What brands do you manufacture in Jootaland? PRASHANT: We manufacture all the local brands. PRASHANT: Action, Campus, Basic, Active, Bata. TEHELKA: From where do you get your workers? PRASHANT: We have our people there. Impatiently, he dismisses further queries. TEHELKA has not been able to establish independently whether Jootaland is indeed part of the supply chain to the brands Prasad mentions. However, alarmingly, Prasad did provide us a sample of a BATA sandal (Art. no. 601-9008) manufactured in the factory. And the Punjabi Bagh SDM, PR Jha confirmed the fact. “The rescued children were employed in the stitching department and were preparing BATA sandals,” Jha told TEHELKA. Given the number of fake goods in the market, TEHELKA still cannot vouchsafe for the truth of this, but it is an important sign for big companies to audit the ethics of their manufacturing chain. On 5 March this year, 27 children were rescued from Jootaland by Bachpan Bachao Andolan. A conversation with one of the rescued kids, Saahil, 10, sheds grim light on the conditions the children work in. The children again mention working in the assembly line for mega sports shoe brands. To reiterate, TEHELKA could not independently corroborate the authenticity of this claim. TEHELKA: What do you do in the factory? SAAHIL: I am in the stitching department. SAAHIL: It’s a 12-hour shift. TEHELKA: How much are you paid? SAAHIL: 30 an hour. Saahil is probably too young to compute his earnings. We asked another, older boy similar questions. TEHELKA: What all brands do you make? JAAMIL: Adidas, Reebok and Airforce. TEHELKA: How much money does your seth pay you? TEHELKA: How long have you been working? TEHELKA: Have you ever been paid? JAAMIL: The seth says he will give me the money when I go back to my village. JAAMIL: From 9 in the morning till 9.30 at night. Though SDM, PR Jha was part of the rescue team, in a defeating twist, like Maulvi Kadri, Prashant Prasad is arrested and let out on bail a week later. the accused. This goes into a corpus, which is meant to providing a monthly amount to the rescued child till the age of 18. If the accused is charged under the Bonded Labour Act, he must pay an immediate additional fine of Rs. 20,000 to the parents of the rescued child. Obviously, none of these are proving to be sufficient deterrence. Saddam, 12, from Shahjahanpur in Uttar Pradesh was sent to the Tartul Quran Jamia Madrassa (near Batla House) four years ago. The Tartul Madrassa is apparently affiliated to the Deobandi sect. At this madrassa, Saddam attends classes on the Shariat for two hours every Sunday. The rest of the week, he works in a zari factory from 7 am till 12 midnight. When Saddam first started working, he complained about the work. “The seth then told me to take off my clothes and raped me,” says he. When he tried to tell Maulvi Shah Ahmed Noorani, his supposed caretaker, about it, the maulvi laughed it off. “Maza aaya (did you enjoy it)?” he asked. Saddam copes with his trauma by sniffing liquid shoe polish, a substance commonly abused by boys on the street. “It gives me relief,” Saddam says. “I get energy from it.” He hasn’t been home even once: it is difficult to do that on pocket money of Rs. 50 a week, which is all he gets for working 17 hours a day, six days a week. He tried to run away from the factory once but was chased, caught and chained for the next two days. He says he will try to escape again. When TEHELKA tried to confront the madrassa about this story, Hasan Adrar, the maulvi in charge, refused to talk, saying we were trying to tarnish the madrassa’s image and defame Islam. There are an estimated one million working children under the age group of 14. Child labour is banned in 16 occupations and 65 types of work (processes) listed in the Child Labour (Prohibition and Regulation) Act. At least 80 percent of major US clothing firms farm out their production to India due to cheap labour. There are more than 7,000 zari units in Delhi alone (according to estimates BBA). Given these staggering numbers and the profound story of poverty and deprivation that underlies this investigation, perhaps it is best to end with the hopeful note struck by the Muslim elders TEHELKA spoke to: that cognisance will be taken. And punishment will be meted.